The Egg Nebula is a preplanetary nebula, created by a dying star in the process of becoming a planetary nebula. Planetary nebulas have nothing to do with planets – the name arose when 18th century astronomers spotted them in their telescopes and thought they looked like planets. Instead, they are the remnants of material expelled by Sun-like stars in the later stages of their lives. The preplanetary nebula phase is extremely short-lived in astronomical terms – only a few thousand years. This makes them rare objects and, combined with the fact that they are quite faint, rather difficult to spot. The Egg Nebula, located around 3000 light years from us, was the first of its kind to be discovered in the 1970s. This image is based on observations performed in the mid 1990s by the Wide Field and Planetary Camera 2 (WFPC2) on the NASA/ESA Hubble Space Telescope. During the preplanetary nebula phase, the central star periodically sheds its outer layers, which are then illuminated by the dying star at the centre. Eventually the star stops shedding material and the core remnant heats up, exciting the expelled gas so that it glows brightly and becomes a planetary nebula. The dark band, sweeping beams, and criss-crossing arcs in this image can reveal a lot about the complex environment of a dying star. The central band is a cocoon of dust hiding the star from view. Beams of light emanate from the obscured star, and it is thought that they are due to starlight escaping from the ring-shaped holes in the dusty cocoon that surrounds the star. The holes are possibly carved by a high-speed stream of matter, although the cause of these jets are unknown. The spoke-like features are shadows cast by blobs of material within the region of the holes in the cocoon. 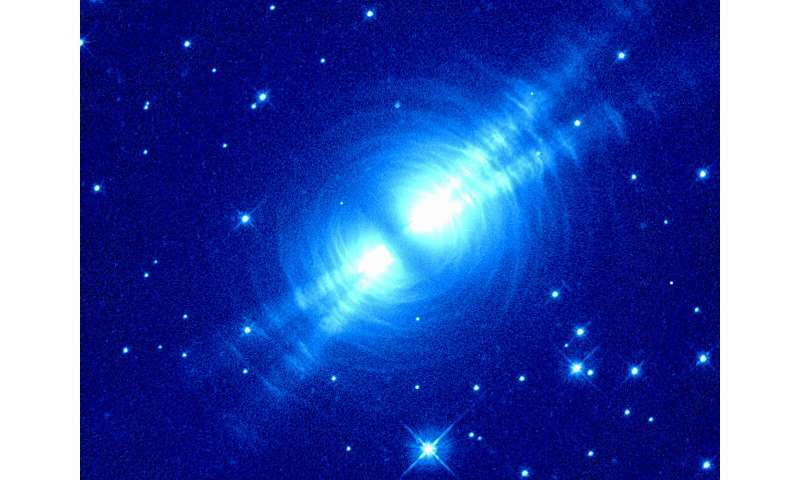 Numerous bright arcs intersect the beams: these are shells of matter ejected by the star. The arcs are like tree rings, and can tell us something about the object's age as they reveal that the rate of mass ejection has varied between 100 and 500 years throughout its 10 000 year history. The gas is expanding at a rate of 20 km/s and matter has been detected out to a radius of 0.6 light years, providing an estimate of the amount of matter in the nebula.